Instead of using billions of tiny hair-like structures and Van der Waals forces to stick to walls and ceilings like a real gecko does, Thames & Kosmos new Geckobot kit employs tiny air pumps and suction cups to climb vertical surfaces without falling and smashing. 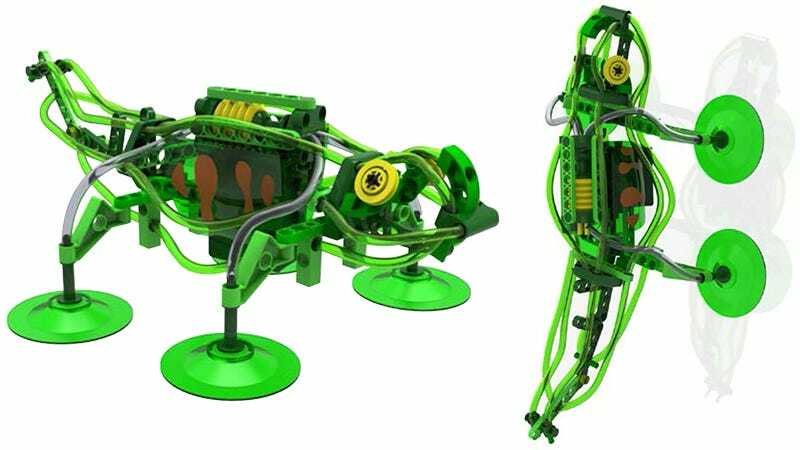 The biological science behind the kit might not be 100 percent accurate, but while building the Geckobot, which assembles not unlike a Lego Technic kit, kids will still learn about mechanical engineering, physics, and why they’ll probably never be able to stick to walls like Spider-Man can. Available starting in June for $50, the Geckobot runs on a single electric motor that powers both the stepping motions of the robot’s four legs, and a compact air pump that ensures the suction cups only stick at the appropriate time needed for them to adhere to any smooth surface. The Geckobot’s simple engineering is almost as clever as how a real Gecko manages to stick to surfaces, and you don’t have to keep running to the pet store to buy crickets to keep it alive. You’ll just need some fresh batteries now and then.